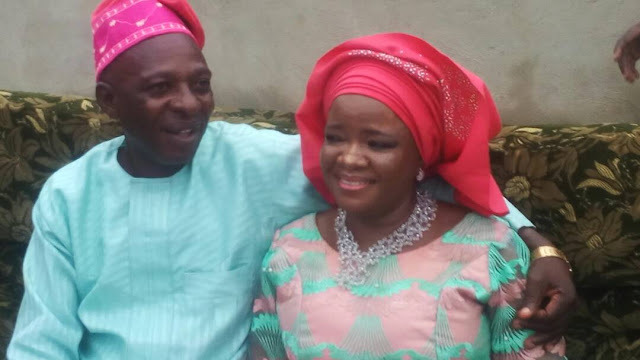 It was a day of joy and bewilderment as a 50 year-old spinster, who was never married, finally hooked her heartrob at the weekend in Abuja at an event greeted with fanfare given its uniqueness. The newest bride in town, Omolayo Oyeyemi Oyewole is an ordained Deaconess of the Redeemed Christian Church of God (RCCG) of Fountain of Living Water Parish, Tudun Wada, FHA Lugbe, Federal Capital Territory (FCT) Abuja. The wedding solemnisation took place at RCCG Resurrection Parish, Babangida area of Lugbe in FCT where the groom, a practising RCCG Pastor, Mike Gbade Adetutu, exchanged vows with his bride. Omolayo is said to have remained calm and exhibited high moral standards during her spinstership period despite her age, hence she was ordained a Deaconess. While Adetutu was a widower before their paths crossed. According to a member of Omolayo’s parish, Mrs Shade Areo, she described yesterday’s event as a “wonder wedding” made in heaven. “To God be the glory after much waiting, God finally put smiles on the faces of Deaconess Omolayo. Indeed, God is Great!” she exclaimed. All attempts to speak with either the bride or her groom proved abortive as they were carried away with the joy of the historic day in their lives.